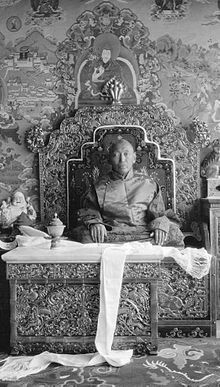 ↑ [the Dalai Lama] had been treated with all the ceremony which could have been accorded to any independent sovereign, and nothing can be found in Chinese works to indicate that he was looked upon in any other light." ↑ The Dalai Lama was about five feet six inches in height. His complexion was the darker hue of one who is lowly born. The nose was lightly aquiline. The large well-set ears were a sign that he was an incarnation of Chen-re-zi. Eyebrows curved high and a full moustache with the ends well waxed, accentuated the alertness of the administrator, rather than the priest meditating apart. His dark-brown eyes were large and very prominent. They lit up as he spoke or listened, and his whole countenance shone with a quiet eagerness. He had small, neat hands and the closely shaven head of the priest. ↑ I am now in the fifty-eighth year of my life. Everyone must know that I may not be around for more than a few years to discharge my temporal and religious responsibilities. You must develop a good diplomatic relationship with our two powerful neighbors: India and China. Efficient and well-equipped troops must be stationed even on the minor frontiers bordering hostile forces. Such an army must be well trained in warfare as a sure deterrent against any adversaries. Furthermore, this present era is rampant with the five forms of degenerations, in particular the red ideology. In Outer Mongolia, the search for the reincarnation of Jetsundampa was banned; the monastic properties and endowments were confiscated; the lamas and monks forced into the army: and the Buddhist religion destroyed, leaving no trace of identity. Such a system, according to the reports still being received, has been established in Ulan Bator. In future, this system will be certainly be forced either from within or from outside the land that cherished the joint spiritual and temporal system. If, in such an event, we fail to defend our land, the holy lamas including “the triumphant father and son” will be eliminated without a trace of their names remaining; the properties of the reincarnate lamas and of the monasteries along with their endowments for religious services will be seized. Moreover, our political system originated by the three ancient kings will be reduced to empty name; my officials, deprived of their patrimony and property, will be subjugated, as slaves for the enemies; and my people subjected to fear and miseries, will be unable to endure day or night. Such an era will certainly come. ↑ ক খ Bell, Charles (1946) Portrait of a Dalai Lama: the Life and Times of the Great Thirteenth, Publisher: Wisdom Publications (MA), January 1987, আইএসবিএন ৯৭৮-০-৮৬১৭১-০৫৫-৩ (first published as Portrait of the Dalai Lama: London: Collins, 1946). ↑ Richardson, Hugh E.: Tibet & its History, Shambala, Boulder and London, 1984, p.268-270. The full English version of the convention is reproduced by Richardson. ↑ Bell, Charles (1924) Tibet: Past and Present. Oxford: Clarendon Press; p. 288. ↑ ক খ Rockhill, W.W. 1910. “The Dalai Lama of Lhasa and their relations with Manchu Emperors of China, 1644-1908” T'oung Pao, vol. 11, pp: 1-104. ↑ French, Patrick. Younghusband: The Last Great Imperial Adventurer, p. 258. (1994). Reprint: Flamingo, London. আইএসবিএন ৯৭৮-০-০০-৬৩৭৬০১-৯. ↑ Mayhew, Bradley and Michael Kohn. (2005). Tibet, p. 32. Lonely Planet Publications. আইএসবিএন ১-৭৪০৫৯-৫২৩-৮. ↑ Dowman, Keith. (1988). The Power-Places of Central Tibet: The Pilgrim's Guide, p. 49. Routledge & Kegan Paul Ltd., London. আইএসবিএন ০-৭১০২-১৩৭০-০. ↑ ক খ Norbu, Thubten Jigme and Turnbull, Colin M. (1968). Tibet: An account of the history, the religion and the people of Tibet. Reprint: Touchstone Books. New York. আইএসবিএন ০-৬৭১-২০৫৫৯-৫, pp. 317–318. ↑ Laird, Thomas (2006). The Story of Tibet: Conversations with the Dalai Lama, p. 221. Grove Press, N.Y. আইএসবিএন ৯৭৮-০-৮০২১-১৮২৭-১. ↑ Dalai Lama: The Soul of Tibet (2005) (DVD). A&E Biography. 2005. Gelek, Surkhang Wangchen. 1982. "Tibet: The Critical Years (Part 1) "The Thirteenth Dalai Lama". The Tibet Journal. Vol. VII, No. 4. Winter 1982, pp. 11–19. Mullin, Glenn H. (2001). The Fourteen Dalai Lamas: A Sacred Legacy of Reincarnation, pp. 376–451. Clear Light Publishers. Santa Fe, New Mexico. আইএসবিএন ১-৫৭৪১৬-০৯২-৩. Richardson, Hugh E.(1984): Tibet & its History. Boulder and London: Shambala. আইএসবিএন ০-৮৭৭৭৩-২৯২-২. Tsering Shakya. 2005. "The Thirteenth Dalai Lama, Thubten Gyatso. "In Brauen, Martin, ed. The Dalai Lamas: A Visual History. London: Serindia, pp. 137–161. Ya Hanzhang. 1991. The Biographies of the Dalai Lamas. Beijing: Foreign Languages Press. Kuleshov, Nikolai S. 1996. Russia's Tibet File, Dharamsala: Liberary of Tibetan Works and Archives. Damdinsüren. 1997. Tales of An Old Lama. Tring: The Institute of Buddhist Studies.